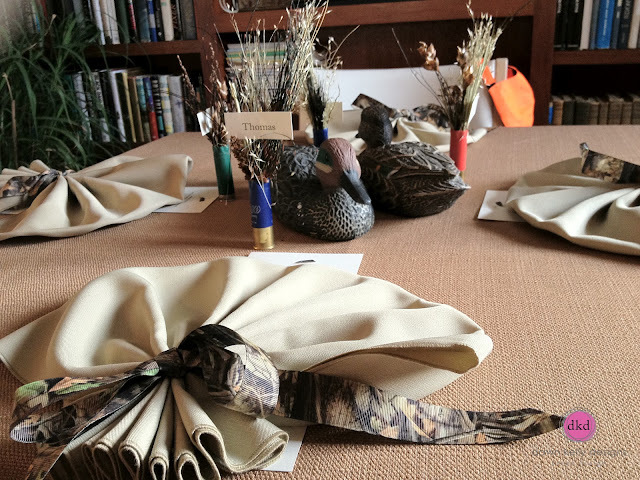 We are excited to share all the fun details of this duck hunting inspired birthday party we recently did. But first, a little back story of how our design process happens. Every client we work with has a different timeline. 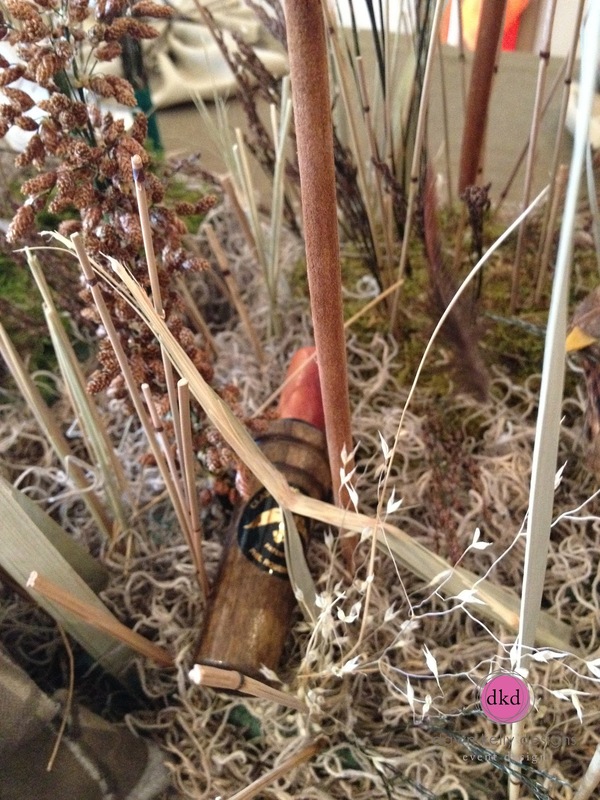 For most weddings, we start a year in advance gathering details, inspirations, design ideas. For corporate events and parties, that timeline is usually somewhere between three to six months. From time to time, we have clients who come to us with busy schedules, and we execute events in a much shorter time frame. 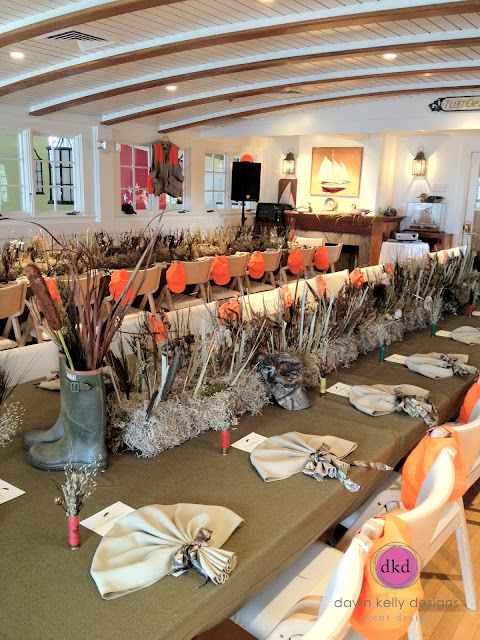 For this party, we pulled the details together in all of 22 days. When the client initially called, there were a lot of hobbies we had to choose from. Squash, and tennis were at the top of the list. We do a lot of golf related ideas out here on Nantucket so we jumped at the opportunity to create a runner of marsh's down the long tables for a nature inspired look. 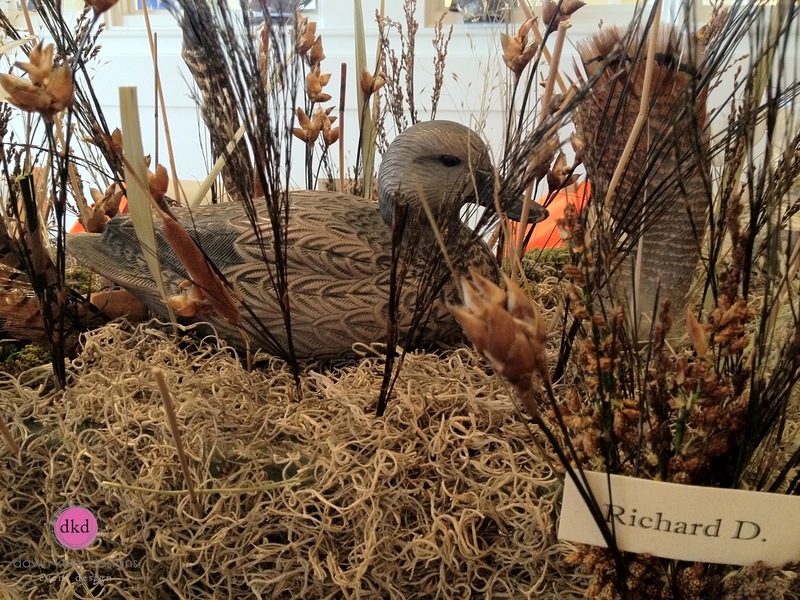 Our client was gracious enough to let us use their duck decoys, used shot gun shells, waders, wellies, jackets.....they even collected quail feathers for us to add to our coveys (yes, we learned A LOT doing this event. If you have ever met Dawn, you know she is a girly girl, goes for anything with glitter or glitz and has an eye for all things pink). 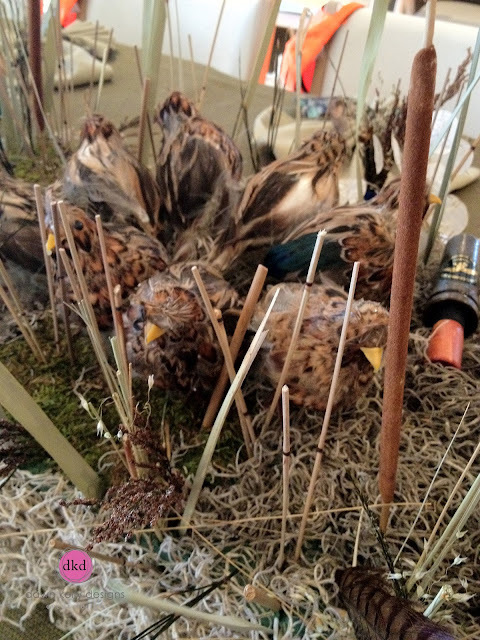 So it was fun for the team to step out in to the wild world of duck hunting. We nestled duck calls, decoys and quail coveys in the marsh. Spanish oak had significant meaning to the client so we were sure to use that throughout the design. Camouflage ribbon was tied around each napkin to bring in more hunting inspiration. 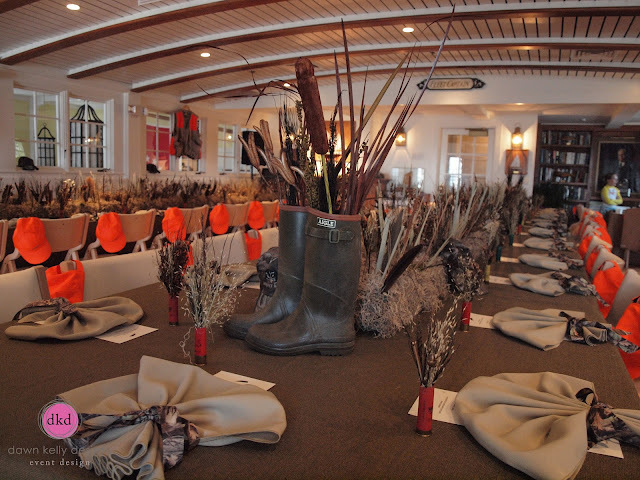 Even more fun for us, the client was able to get cattails, greens, mosses and authentic duck hunting clothing for us to utilize as props. We were in heaven working with all those items. 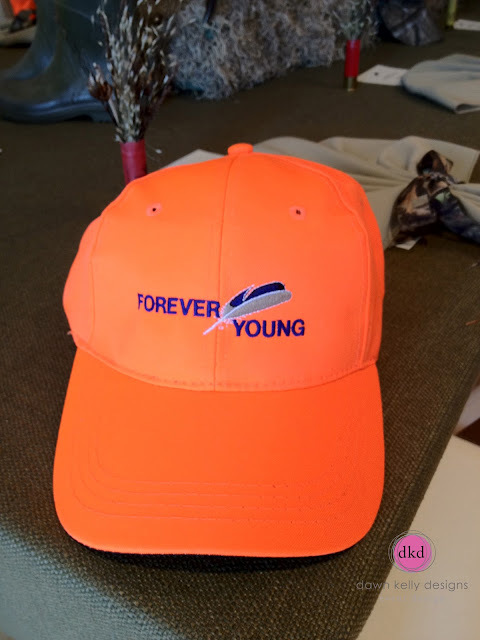 The menu's were topped with an illustration of a quail feather, and custom made hats with 'forever young' in the quintessential orange hunting color greeted each guest as they sat down to dinner. 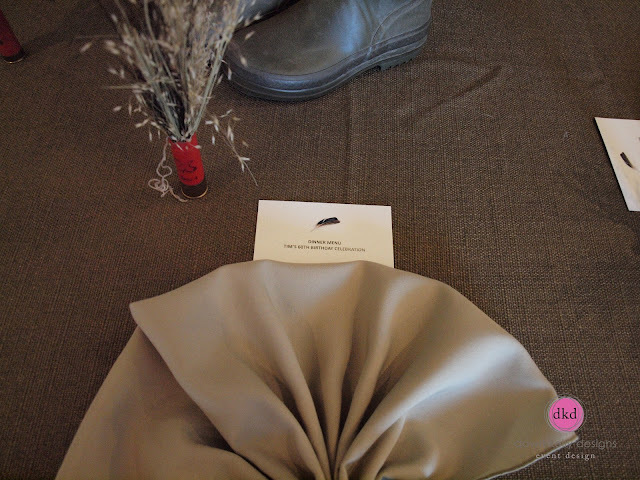 Shot gun shells anchored everyone's place cards. The golfing was eventually worked in to cocktail hr (and we didn't get any images of that - storms were looming) - but the weather held out, a fun video was played, and a great time was had by all! 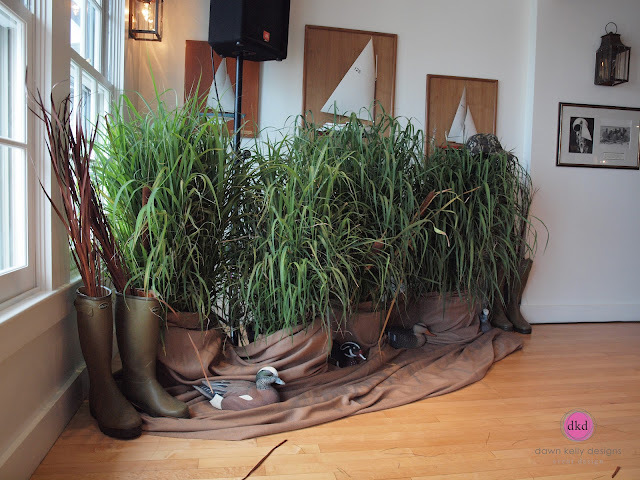 A huge thanks to the team at Nantucket Yacht Club for helping us pull it all together during set up.